We are paid for our suffering and we pay for our happiness. Every ache, every sorrow receives its recompense here on earth. Emerson gives the basis for this conviction. EVER since I was a boy I have wished to write a discourse on Compensation; for it seemed to me when very young that on this subject Life was ahead of theology and the people knew more than the preachers taught. The documents too from which the be doctrine is to drawn, charmed my fancy by their endless variety, and lay always before me, even in sleep; for they are the tools in our hands, the bread in our basket, the transactions of the street, the farm and the dwelling-house; the greetings, the relations, the debts and credits, the influence of character, the nature and endowment of all men. It seemed to me also that in it might be shown men a ray of divinity, the present action of the Soul of this world, clean from all vestige of tradition; and so the heart of man might be bathed by an inundation of eternal love, conversing with that which he knows was always and always must be, because it really is now. It appeared moreover that if this doctrine could be stated in terms with any resemblance to those bright intuitions in which this truth is sometimes revealed to us, it would be a star in many dark hours and crooked passages in our journey, that would not suffer us to lose our way. The fallacy lay in the immense concession that the bad are successful; that justice is not done now. The blindness of the preacher consisted in deferring to the base estimate of the market of what constitutes a manly success, instead of confronting and convicting the world from the truth; announcing the Presence of the Soul; the omnipotence of the Will; and so establishing the standard of good and ill, of success and falsehood, and summoning the dead to its present tribunal. I find a similar base tone in the popular religious works of the day and the same doctrines assumed by the literary men when occasionally they treat the related topics. I think that our popular theodogy has gained in decorum, and not in principle, over the superstitions it has displaced. But men are better than this theology. Their daily life gives it the lie. Every ingenuous and aspiring soul leaves the doctrine behind him in his own experience, and all men feel sometimes the falsehood which they cannot demonstrate. For men are wiser than they know. That which they hear in schools and pulpits without afterthought, if said in conversation would probably be questioned in silence. If a man dogmatize in a mixed company on Providence and the divine laws, he is answered by a silence which conveys well enough to an observer the dissatisfaction of the hearer, but his incapacity to make his own statement. POLARITY, or action and reaction, we meet in every part of nature; in darkness and light, in heat and cold; in the ebb and flow of waters; in male and female; in the inspiration and expiration of plants and animals; in the systole and diastole of the heart; in the undulations of fluids and of sound; in the centrifugal and centripetal gravity; in electricity, galvanism, and chemical affinity. Superinduce magnetism at one end of a needle, the opposite magnetism takes place at the other end. If the south attracts, the north repels. To empty here, you must condense there. An inevitable dualism bisects nature, so that each thing is a half, and suggests another thing to make it whole; as, spirit, matter; man, woman; subjective, objective; in, out; upper, under; motion, rest; yea, nay. The theory of the mechanic forces is another example. What we gain in power is lost in time, and the converse. The periodic or compensating errors of the planets is another instance. The influences of climate and soil in political history are another. The cold climate invigorates. The barren soil does not breed fevers, crocodiles, tigers, or scorpions. The same dualism underlies the nature and condition of man. Every excess causes a defect; every defect an excess. Every sweet hath its sour; every evil its good. Every faculty which is a receiver of pleasure has an equal penalty put on its abuse. It is to answer for its moderation with its life. For every grain of wit there is a grain of folly. For every thing you have missed, you have gained something else; and for every thing you gain, you lose something. If riches increase, they are increased that use them. If the gatherer gathers too much, nature takes out of the man what she puts into his chest; swells the estate, but kills the owner. Nature hates monopolies and exceptions. The waves of the sea do not more speedily seek a level from their loftiest tossing than the varieties of condition tend to equalize themselves. There is always some levelling circumstance that puts down the overbearing, the strong, the rich, the fortunate, substantially on the same ground with all others. Is a man too strong and fierce for society and by temper and position a bad citizen,—a morose ruffian, with a dash of the pirate in him?—nature sends him a troop of pretty sons and daughters who are getting along in the dame’s classes at the village school, and love and fear for them smooths his grim scowl to courtesy. Thus she contrives to intenerate the granite and felspar, takes the boar out and puts the lamb in and keeps her balance true. The farmer imagines power and place are fine things. But the President has paid dear for his White House. It has commonly cost him all his peace, and the best of his manly attributes. To preserve for a short time so conspicuous an appearance before the world, he is content to eat dust before the real masters who stand erect behind the throne. Or do men desire the more substantial and permanent grandeur of genius? Neither has this an immunity. He who by force of will or of thought is great and overlooks thousands, has the responsibility of overlooking. With every influx of light comes new danger. Has he light? he must bear witness to the light, and always outrun that sympathy which gives him such keen satisfaction, by his fidelity to new revelations of the incessant soul. He must hate father and mother, wife and child. Has he all that the world loves and admires and covets?—he must cast behind him their admiration and afflict them by faithfulness to his truth and become a byword and a hissing. This Law writes the laws of the cities and nations. It will not be baulked of its end in the smallest iota. It is in vain to build or plot or combine against it. Things refuse to be mismanaged long. Res nolunt diu male administrari. Though no checks to a new evil appear, the checks exist, and will appear. If the government is cruel, the governor’s life is not safe. If you tax too high, the revenue will yield nothing. If you make the criminal code sanguinary, juries will not convict. Nothing arbitrary, nothing artificial can endure. The true life and satisfactions of man seem to elude the utmost rigors or felicities of condition and to establish themselves with great indifferency under all varieties of circumstance. Under all governments the influence of character remains the same,—in Turkey and New England about alike. Under the primeval despots of Egypt, history honestly confesses that man must have been as free as culture could make him. The world globes itself in a drop of dew. The microscope cannot find the animalcule which is less perfect for being little. Eyes, ears, taste, smell, motion, resistance, appetite, and organs of reproduction that take hold on eternity,—all find room to consist in the small creature. So do we put our life into every act. The true doctrine of omnipresence is that God reappears with all his parts in every moss and cobweb. The value of the universe contrives to throw itself into every point. If the good is there, so is the evil; if the affinity, so the repulsion; if the force, so the limitation. Thus is the universe alive. All things are moral. That soul which within us is a sentiment, outside of us is a law. We feel its inspirations; out there in history we can see its fatal strength. It is almighty. All nature feels its grasp. “It is in the world, and the world was made by it.” It is eternal but it enacts itself in time and space. Justice is not postponed. A perfect equity adjusts its balance in all parts of life. [Greek]. The dice of God are always loaded. The world looks like a multiplication-table, or a mathematical equation, which, turn it how you will, balances itself. Take what figure you will, its exact value, nor more nor less, still returns to you. Every secret is told, every crime is punished, every virtue rewarded, every wrong redressed, in silence and certainty. What we call retribution is the universal necessity by which the whole appears wherever a part appears. If you see smoke, there must be fire. If you see a hand or a limb, you know that the trunk to which it belongs is there behind. Every act rewards itself, or in other words integrates itself, in a twofold manner: first in the thing, or in real nature; and secondly in the circumstance, or in apparent nature. Men call the circumstance the retribution. The casual retribution is in the thing and is seen by the soul. The retribution in the circumstance is seen by the understanding; it is inseparable from the thing, but is often spread over a long time and so does not become distinct until after many years. The specific stripes may follow late after the offence, but they follow because they accompany it. Crime and punishment grow out of one stem. Punishment is a fruit that unsuspected ripens within the flower of the pleasure which concealed it. Cause and effect, means and ends, seed and fruit, cannot be severed; for the effect already blooms in the cause, the end preexists in the means, the fruit in the seed. Whilst thus the world will be whole and refuses to be disparted, we seek to act partially, to sunder, to appropriate; for example,—to gratify the senses we sever the pleasure of the senses from the needs of the character. 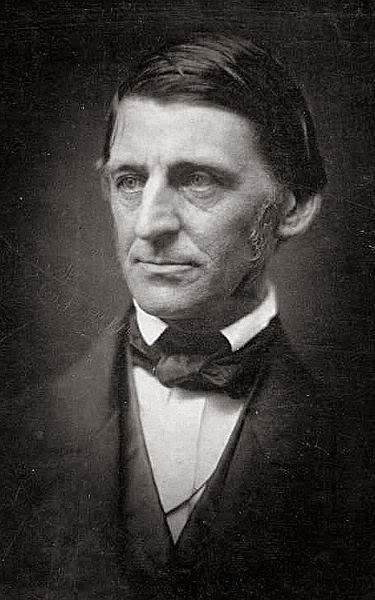 The ingenuity of man has been dedicated to the solution of one problem,—how to detach the sensual sweet, the sensual strong, the sensual bright, etc., from the moral sweet, the moral deep, the moral fair; that is, again, to contrive to cut clean off this upper surface so thin as to leave it bottomless; to get a one end, without an other end. The soul says, Eat; the body would feast. The soul says, The man and woman shall be one flesh and one soul; the body would join the flesh only. The soul says, Have dominion over all things to the ends of virtue; the body would have the power over things to its own ends. The soul strives amain to live and work through all things. It would be the only fact. All things shall be added unto it,—power, pleasure, knowledge, beauty. The particular man aims to be somebody; to set up for himself; to truck and higgle for a private good; and, in particulars, to ride that he may ride; to dress that he may be dressed; to eat that he may eat; and to govern, that he may be seen. Men seek to be great; they would have offices, wealth, power, and fame. They think that to be great is to get only one side of nature,—the sweet, without the other side,—the bitter. A plain confession of the in-working of the All and of its moral aim. The Indian mythology ends in the same ethics; and indeed it would seem impossible for any fable to be invented and get any currency which was not moral. Aurora forgot to ask youth for her lover, and though so Tithonus is immortal, he is old. Achilles is not quite invulnerable; for Thetis held him by the heel when she dipped him in the Styx and the sacred waters did not wash that part. Siegfried, in the Nibelungen, is not quite immortal, for a leaf fell on his back whilst he was bathing in the Dragon’s blood, and that spot which it covered is mortal. And so it always is. There is a crack in every thing God has made. Always it would seem there is this vindictive circumstance stealing in at unawares even into the wild poesy in which the human fancy attempted to make bold holiday and to shake itself free of the old laws,—this back-stroke, this kick of the gun, certifying that the law is fatal; that in nature nothing can be given, all things are sold. This is that ancient doctrine of Nemesis, who keeps watch in the Universe and lets no offence go unchastised. The Furies they said are attendants on Justice, and if the sun in heaven should transgress his path they would punish him. The poets related that stone walls and iron swords and leathern thongs had an occult sympathy with the wrongs of their owners; that the belt which Ajax gave Hector dragged the Trojan hero over the field at the wheels of the car of Achilles, and the sword which Hector gave Ajax was that on whose point Ajax fell. They recorded that when the Thasians erected a statue to Theogenes, a victor in the games, one of his rivals went to it by night and endeavored to throw it down by repeated blows, until at last he moved it from its pedestal and was crushed to death beneath its fall.